Marine Landing on beach head. provide fire support to the dismounted infantry. 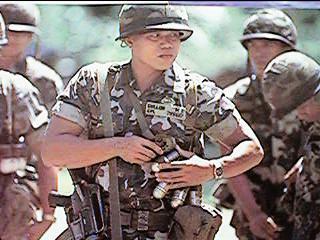 Marine grenadier checks his 40mm grenade rounds for his M203 Grenade Launcher. 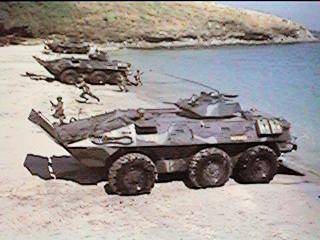 V-300 practice a beach landing in one of the coves at the Philippine Marine Corps Tranining Base, at Ternate, Cavite, Philippines. The V-300 is manufactured by Textron Land & Marine Systems of New Orleans, LA, USA. Cadillac Gauge was acquired by Textron and the manufacture of armored cars like the V-300 and the V-150 Commando family of vehicles was co-located with that of the LCAC (Landing Craft Air Cushioned) used by the US Navy. 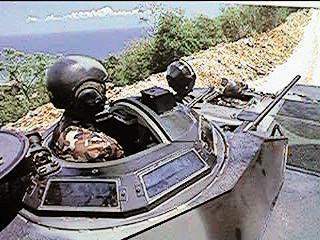 Vehicle commander of V-300 cover the road ahead as the vehcile advances. This is a 1-meter turret that has a Cal. 50 and 7.62mm machinguns as armaments. 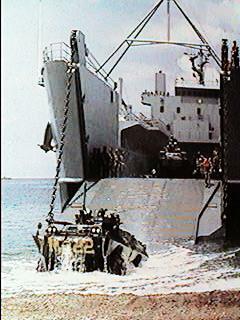 A similar turret is used on the USMCs AAV-7 but with the Cal. 50 and 40mm MK19 Automatic Grenade Launcher combination. 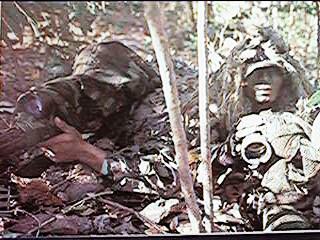 Philippine Marine Scout Snipers keep a look out for targets. 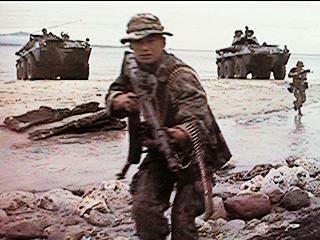 They (Sniper and Observer) function as scouts with the ability to call in fire support as Forward Observers. If needed, they can engage high value targets with their 5.56mm MSSR rifles. 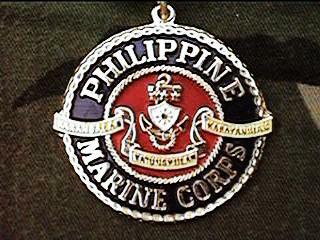 Other units still use M-14 rifles while awaiting issue of the Marine Scout Sniper Rifles. Do you want more information on the book?